When dealing with logistics, there is no ceiling limit for innovation or improvement. Taking into account the customers’ viewpoint, TRADIA always proposes solutions for more efficient transportation to optimize their entire logistics process. Beyond the conventional framework of freight forwarding, we combine the know-how with network and information technologies, to reduce costs and lead time. We also commit ourselves to minimizing the use of trucks, in order to reduce CO2 emissions. 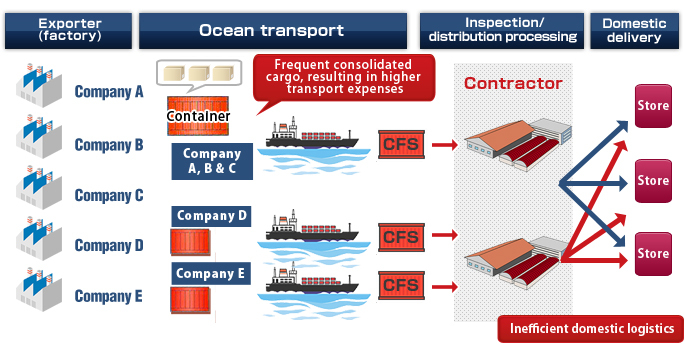 【2】 A majority of cargo shall be delivered in the early morning period on schedule, resulting in poor load efficiency. Arrangements were made to ensure that half of the freight that had been landed at Osaka or Kobe and forwarded to the Tokyo Metropolitan area (Chiba, Saitama, Tokyo, Kanagawa and Ibaraki) would be landed at Tokyo. 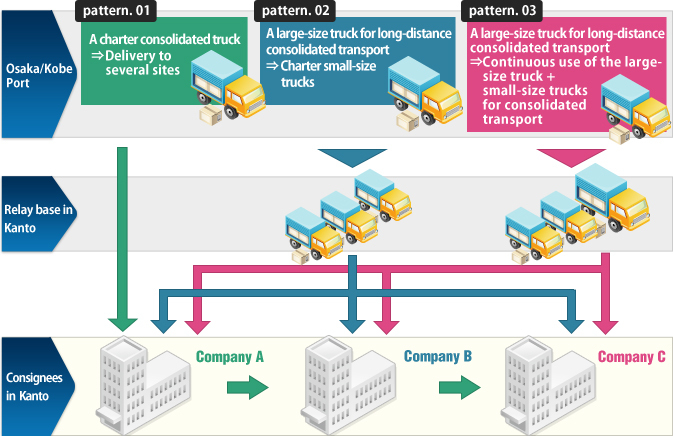 Solution 2:　Efforts for utilizing "charter consolidated truck"and "liner consolidation service"
For freight transport from Osaka and Kobe ports to the Kanto Region, more than a few 4-ton trucks were chartered because of the specified delivery time. We have set up a “relay base” in Kanto, so that consolidated cargo trucks can be prepared for transport between Kansai and the relay base and that charter trucks can be used from the base by consignees to achieve more efficient transportation. TRADIA has upgraded “buyer consolidation,” and complete inspection, tagging, and even assortment of goods for individual stores in manufacturer countries to achieve further cost reduction and higher efficiency in logistics. ・ Instead of individual shipments arranged by shippers, cargo can be stably shipped by regular liner services. ・At each port in Japan, unified devanning site is fixed, from which all goods are delivered. 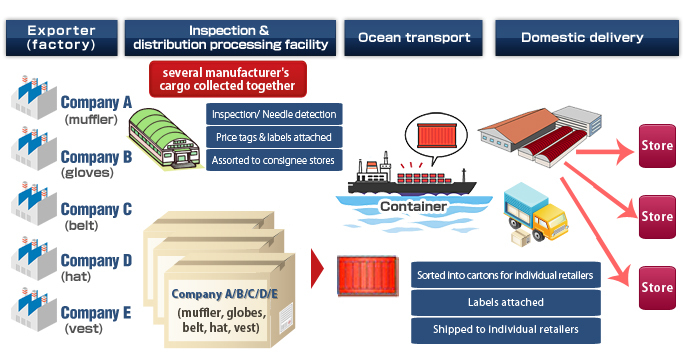 As inspection and assortment is completed in manufacturer's country costs can be reduced and no defective product will be shipped from the shipping point.